Primary Natural Resources petroleum, uranium, fish. THE REPUBLIC OF CHAD is a LANDLOCKED country located in north-central Africa. It is bounded by LIBYA, NIGER, NIGERIA, CAMEROON, the CENTRAL AFRICAN REPUBLIC, and SUDAN. The country is about 85 percent of the size of ALASKA. 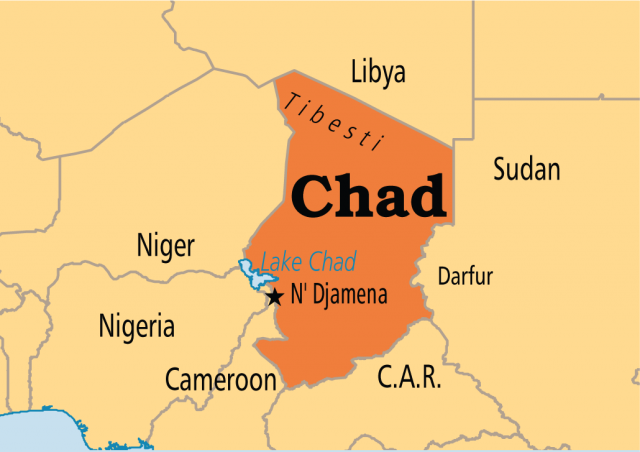 Chad got its name from Lake CHAD, which lies on the western border with Niger and Nigeria. The lake decreases in size during the dry season. The south is mostly wooded terrain, which becomes brushy as you near Lake Chad. From the lake, the land rises gradually to the Ennedi Plateau and the Tibesti Ranges, formed from volcanoes. Some of the mountains reach a height of 11,000 ft (3,353 m). The SAHARA DESERT covers part of the northern half of the country. The two important rivers in Chad, the Chari and the Logone, both flow into Lake Chad. They are used for crop IRRIGATION and during some seasons are navigable. There are three climatic regions in Chad. The south has a more tropical climate, with wet and dry seasons. The central zone is covered by sand and has light rain. The northern area has a true desert climate, with hot, arid conditions and almost no rain. Chad’s population is made up of many different ethnic groups. Most of the population is concentrated in the south, and the people there live sedentary lives, pursuing agriculture. The people include the Sara, Massa, Ngambaye, and Moundang. Most of them are Christians, but a few still follow traditional religions. The people of the north are nomadic or seminomadic and are Muslims. They include Arabs, Tuareg, Hadjerai, Fulbe, and Toubou. There are two official languages in Chad—Arabic and French. Many of the people speak tribal languages and dialects, too. N’Djamena, the capital and largest city, has about 530,000 people. Other cities include Moundou, Sarh, and Abeche. The southern area, around Lake Chad and the two rivers, is the most fertile area of Chad, and most of the food for the country is grown there. It is also the only area with much animal life, which consists mainly of birds and antelope. Economic development in Chad has been severely hampered by its landlocked position, poor transportation, political turmoil, and lack of natural resources. Some textiles are produced in Chad, and there are food-processing operations as well. Their imports of machinery, transportation equipment, food, petroleum products and industrial goods outweigh their exports of cotton, cattle, textiles, and fish. Their chief trading partners are SOUTH AFRICA, Cameroon, and FRANCE. Chad has one of the lowest per capita incomes in the world. Chad’s position near Lake Chad has always made it a focal point of Saharan trade routes. This has caused dissension and turmoil through the years, as different groups wanted to control the routes. Finally, a democracy was established in 1996 and multiparty presidential elections were held. But since that time, there have been disputes and fighting within the country.